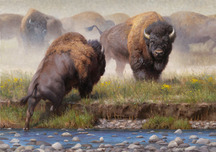 As a native of the West, Kyle Sims' love of the vast landscapes and the array of animals inhabiting them came naturally. Early exposure to wildlife has made Sims feel at home in the wild among the many creatures such as elk, bison, deer, pronghorn, bighorn sheep, and moose. 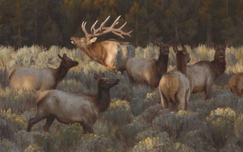 Kyle Sims captures the essence of all that nature offers to him to tell a story through his canvases. 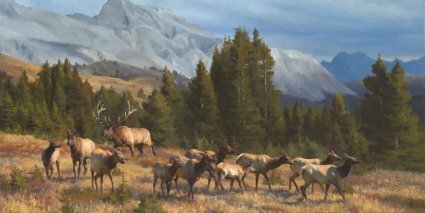 Kyle Sims paints to visually relive the experiences he has had in the wild. 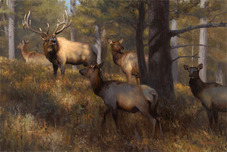 Kyle Sims says, "being in close contact with creatures other than human is very exciting and emotionally stimulating. I have to relay that onto canvas so as to share it with others. 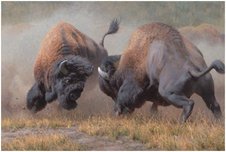 Some of the animals can be very aggressive and unpredictable. 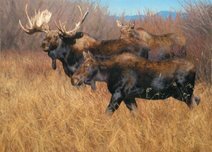 Other animals can be extremely social, much like humans, causing my curiosity to grow. That is why I paint what I paint."